It's that time of year again. You old lease is up and it's time to move on to a new location. Maybe you've been through the process before but made some mistakes along the way that cost you money. Or maybe you're a first-time apartment renter and don't know where to begin. To put it straight, looking for an apartment is a hassle. Not only is it time-consuming, but there's a certain amount of risk involved. For example, what if the landlord turns out to be a jerk? Or what if you end up in a bad neighborhood? When looking for an apartment, it's easy to overlook the details. However, doing so could end up costing you your security deposit, or create other unforeseen problems. After weeks of looking for an apartment, you've finally found the one right for you. Although you're eager, don't forget to take the time to yourself to carefully review the rental agreement before signing. Not doing so could end up costing you both money and mental health. Go through the lease slowly and ask the landlord for clarification on anything you're unsure about. Take note of the length of the lease, how much rent is, when rent is due, penalties for late payment, and other rules such as sub leasing or rules about roommates. Be especially wary of any special clauses. Getting into your own apartment requires you to fork over a security deposit. That's a lot of money, and you hope to get as much of it back as you possibly can. To help ensure that happens, try documenting any damage prior to signing the lease. A good time to do this is when you meet with the landlord to review and sign the rental agreement. Walk through the apartment with the landlord and point out any damage that you might see. Also, don't be afraid to ask the landlord to fix any issues before you move in. Walk through the apartment with the landlord and point out any damage that you might see. Also, don't be afraid to ask the landlord to fix any issues before you move in. If you don't document the damage before entering into the lease, you might be held liable for damages that existed before you moved in. There's nothing worse than discovering your landlord should actually be called a slumlord. A good landlord, however, is a blessing. Good landlords care about their properties, as well as their tenants. After all, the property is an investment and they want to protect its value. As such, a good landlord will be prompt to fix any issues. Alternatively, a bad landlord can make your life unbearable very quickly. Conduct an internet search to see what information you can find. Check with the city or the Better Business Bureau as well. If anything seems sketchy, start looking for different properties. The exterior condition of a property is a good indicator of the interior condition, as well as the quality of the landlord. Try looking into the address with a web search to see what you can find in public records. If the property pulls up violations or small claims filings, consider renting from another landlord. Furthermore, check local police call logs to see what kind of criminal activity is in the area. Looking for an apartment is a hassle, but can you imagine having to find one if something were to happen to yours? Your landlord's insurance likely won't cover the expenses. Take the steps to protect yourself and your property by taking out renters insurance. This might seem obvious, but paying more than you can afford for rent will become problematic very quickly. When looking for an apartment, make a budget and stay within that price range. Doing so will save you from being short or late on rent, which could have serious consequences. Looking for an apartment on the internet is easy. But don't let the pictures fool you. 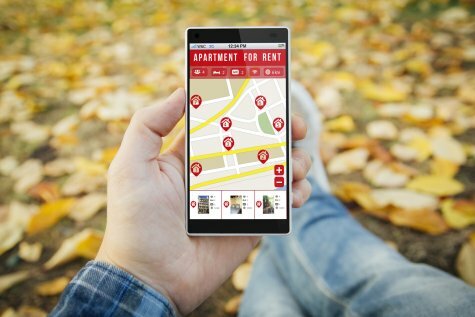 There are many rental scams online, so be sure to view the apartment in person before committing to a lease. Landlords have the power to make certain restrictions of what happens on their property. For example, you might not be able to paint the walls without permission. But tenants have rights, too. While they vary from state to state, there are federal laws which protect renters from discrimination of race, religion, gender, and handicap. For more information about tenant rights, visit the U.S. Department of Housing and Urban Development website. This is similar to not documenting damage before signing a lease. This step, however, goes beyond documenting the damage with a landlord present. This should happen after the lease is signed and before you move in. Keeping a record of the apartment's condition before moving in will help you settle any possible disputes upon moving out. Moving from apartment to apartment might seem like routine after a while. But don't fool yourself into thinking new surroundings will solve problems in other areas of your life. Moving is stressful and costly, so be sure to evaluate other areas of your life before taking that next step into a new location. Now that you know what mistakes to avoid when finding a new apartment, it's time to take the next step. Once you sign the lease and get the keys, take a moment to enjoy your new space and breathe a sigh of relief. If you have any questions about renting an apartment or other properties, contact us today!